This past weekend we celebrated Avery’s Baptism with family and friends. The service was perfect and we are so thankful to our family and friends that were able to attend this special event. 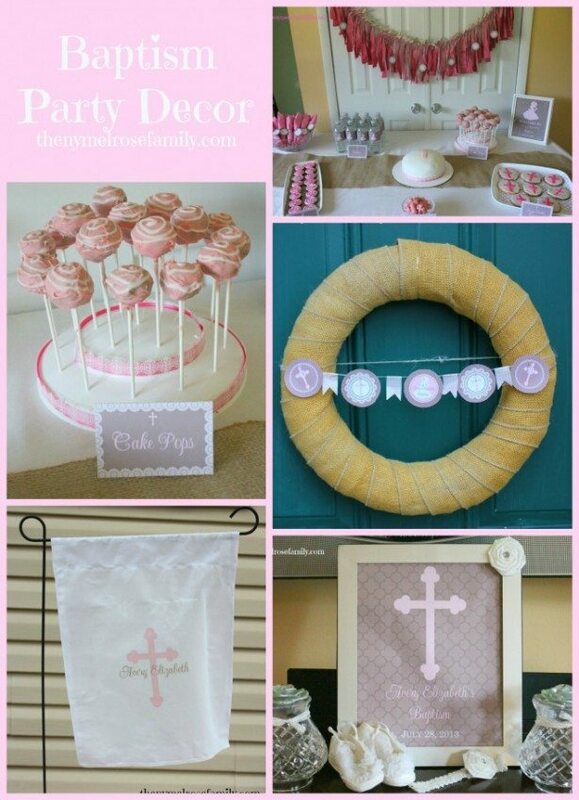 I had so much fun planning her Baptism Party and seeing it come to fruition was fabulous. I wanted to give you all peeks into our Baptism Party Decor and I’ll be sharing recipes and tutorials in the next couple of weeks. Thanks so much! I love the way everything came out. Super fun! I am brainstorming ideas for our third little guy’s Baptism for December (due in early November!!) I can’t wait to see that garden flag! Love it!! The garden flag was definitely a favorite project of mine. It’ll be out tomorrow and I promise you won’t be disappointed. That sounds like such a fun birthday idea. Thanks for entering Heather. Avery is adorable…and so is your decor! I love your dessert table – so sweet. Well done, my friend!! Where did you get the heat transfer sheets? I’m having a difficult finding the type you used. I can only find the ones that need you to cut out the image and then they end up cracking? They have them at Jo Ann Fabric and Craft Stores.